Ed. Nancy Cater and Patricia Reis. 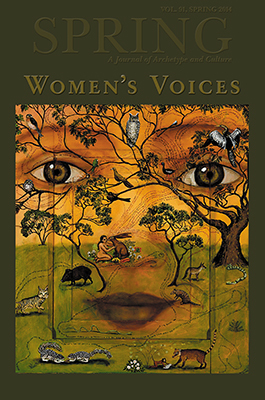 This volume was inspired by When Women Were Birds: Fifty-four Variations on Voice by American writer, naturalist, and environmental activist Terry Tempest Williams. We are honored that Terry Tempest Williams agreed to be interviewed in this issue. The interview with guest co-editor Patricia Reis opens this issue and sets the tone for the articles that follow. Download the interview (pdf). In When Women Were Birds, Terry Tempest Williams asks, “What needs to be counted on to have a voice? Courage. Anger. Love. Something to say; someone to listen.” The sixteen contributors to this volume recognize and demonstrate, directly or indirectly, the truth of Terry Tempest Williams’ observation. Articles address the psychological issues that arise when women attempt to express themselves, the obstacles faced, the obstacles overcome (or not), the creativity that may released. Included are both clinical articles, as well as personal and more academic papers. The contributors come from different places and different backgrounds. They include writers, poets, teachers, analysts, educators, and theorists. Their writing styles vary accordingly, yet their works share similar themes, from the deeply personal to the cultural and historical, from the literary to the mythological and spiritual. Terry Tempest Williams’ statement about voice implies a necessary bond between speaker and listener, or as in this case, author and reader, and it is our hope that this Women’s Voices issue of Spring will encourage such a mutually inspired relationship. Click here to order the book or for more information on contents.